The Sheraton Maldives Full Moon Resort & Spa is only 15 minutes by speedboat from the international airport, which is a relief if you've just stumbled off a long-haul flight. You can faintly see the shape of Male’, the capital of the Maldives, on the horizon from one side of the island and there is the occasional sound of a plane heading to or from the airport, which occasionally bothers a handful of guests. But despite that, the resort is peaceful a world away from the hustle and bustle of the city. It was refurbished and re-branded as a Sheraton several years ago with an exclusive Shine Spa on an adjacent islet, linked by a small bridge. Another refurbishment followed in 2016. There are one or two relics of the resort’s previous ownership, such as a few concrete seawalls in the water (which are tough to remove, although many resorts now opt for more subtle-looking anti-erosion solutions). Both sides of the long, tapering island have a beautiful beach offering safe and sheltered bathing. 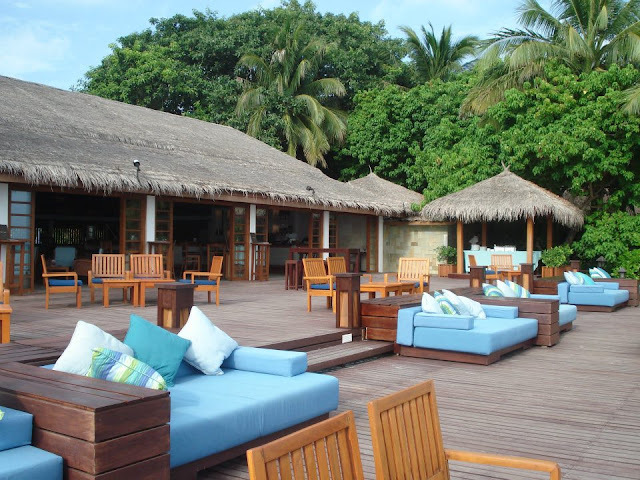 One of the highlights of the Sheraton Maldives Full Moon Resort & Spa is the recently-refurbished Anchorage Bar, which is partially suspended over the beach and the ocean. The spacious wooden sundeck is adorned with four-poster beds for lounging on during the day and several comfortable sofas. 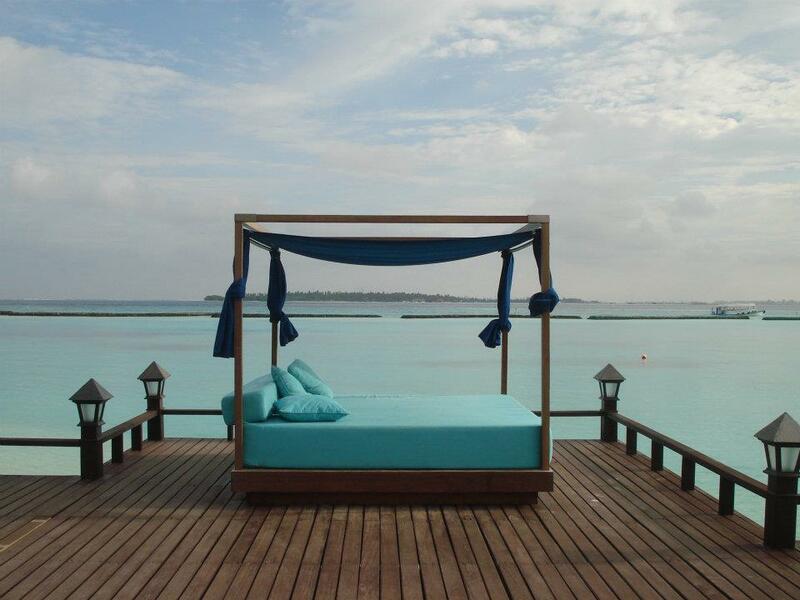 They make for an impressive first sight, with the bright turquoise of the fabrics echoing the shades of the ocean and contrasting with the deep brown of the decking. During the day, you can watch baby black tip reef sharks glide underneath the platform. After sunset, the roof of the bed can be folded down so you can lie back and look at the stars. But once a week it jumps into life for a DJ night which is amongst the best in the Maldives (Kurumba also has a great one). The bar provides all the international branded beverages you would expect, as well as a range of cocktails served with complimentary snacks. Another of the highlights is Baan Thai, the Thai restaurant. Here you can get noodles, rice plates, curries, soups, stir-fries and salads are customized to your taste – the flavours are very authentic. The Anchorage Bar is in a prime position between the lagoon and the attractive freshwater swimming pool with waterfall with most restaurants close by. There’s a wide selection available for the breakfast buffet available at Feast. There are plenty of activities and excursions including day trips to Male’, dolphin-spotting, sunset fishing, sunrise picnics and more. 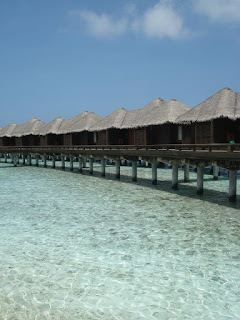 The resort also has a fully-equipped watersports centre and small dive centre. Windsurfing, wakeboarding, snorkelling and scuba diving are amongst the most popular activities. Snorkelers may prefer to book a boat excursion to one of the superb snorkeling spots in the area rather than snorkelling in the lagoon, which doesn’t have much coral, although there are baby black tip reef sharks swimming close to shore and occasionally bigger reef sharks come in if there's a strong incoming current. We were lucky enough to catch sight of some big ones and went to snorkel very close to the pregnant reef sharks but I wouldn't recommend it unless you're a strong swimmer because the currents in the Maldives are brutal. 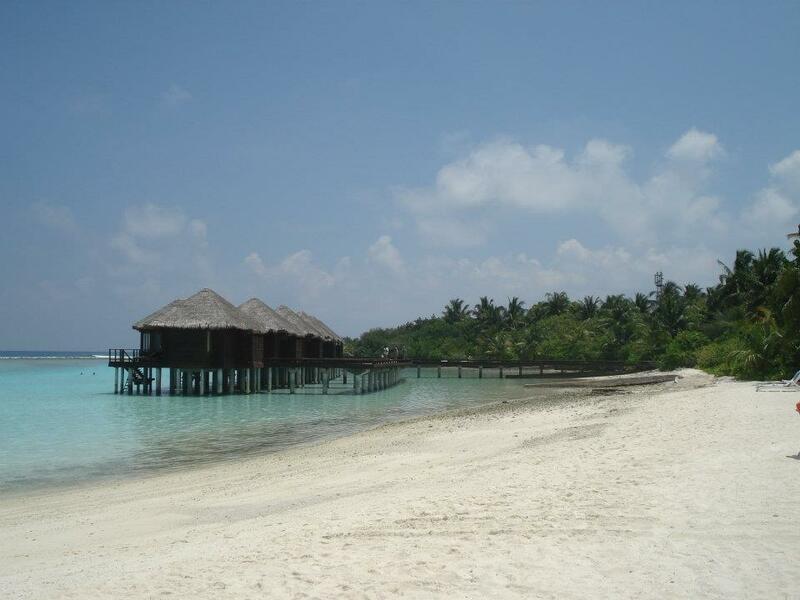 This atoll is perfectly situated for easy-access to the international airport either by speedboat or seaplane charter. Guests can island-hop around local island communities including the capital city, a compact 2.2square mile island. North Male’ Atoll is also home to several famous dive sites including Manta Point and Banana Reef. The Shine Spa is a haven of tranquillity set on a pretty island of its own and features separate private treatment rooms. You get to it by walking over a little footbridge. It's one of the only spas in the Maldives on an island of its own. The fourth ‘wall’ of each room is missing, and is instead replaced by attractive views of the open ocean, so guests can watch dozens of tiny hermit crabs scuttling across the sand as they receive their massages. 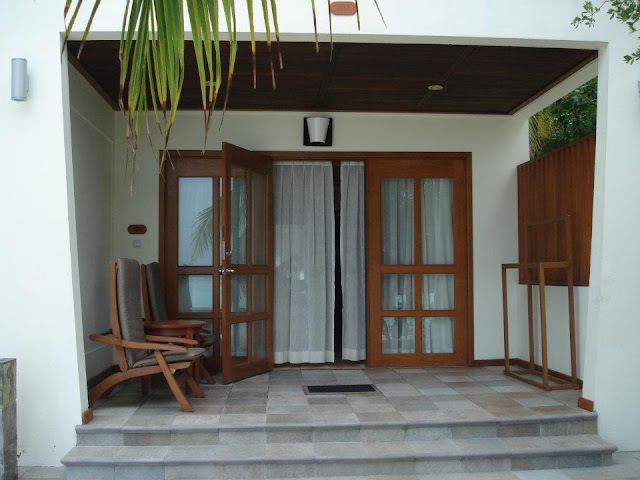 The entry-level Deluxe Beachfront Rooms are part of a two-storey four-room block. Although this isn’t the classic 'Maldives villa style', from the interior of the island they look surprisingly pretty for multi-storey accommodation; with a thatched roof, surrounded by hibiscus and bougainvillea. We stayed in one of these and it was nicely furnished with everything you'd expect at a Sheraton: under-stated quality and an un-fussy style. Some of the rooms only have indoor showers (unlike most resort rooms in the Maldives which have open-air showers in private gardens). However, the private terraces and views help to compensate. The other villa categories provide more of an intimate atmosphere. 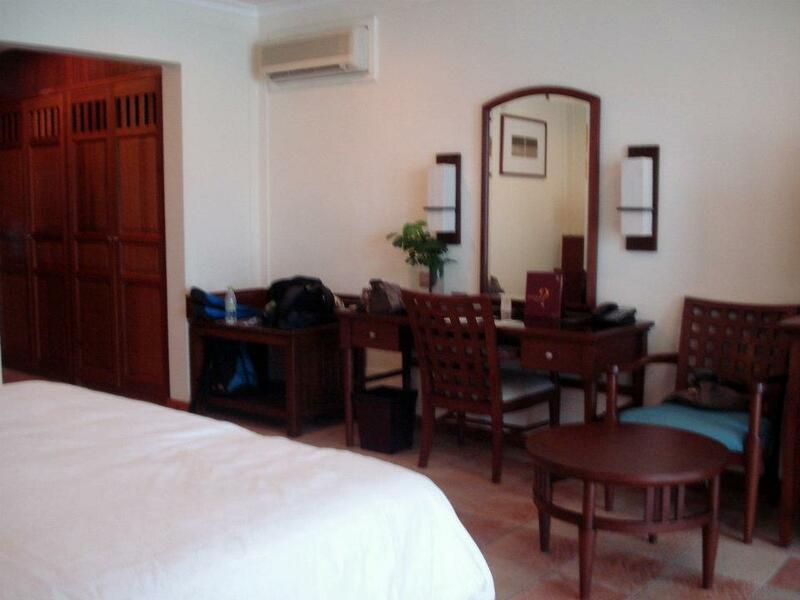 Overall, the rooms and villas are spacious and attractive enough, with fairly simple décor but good quality furniture. The higher category villas are also furnished in a contemporary and fairly un-fussy style with hints of turquoise and brown, some with private plunge pools. The Sheraton Full Moon may have a higher concentration of villas per square metre of the island than similar resorts in the area but it offers a good level of amenities and service and a more lively atmosphere than many other resorts in the country. The guests are a mix of nationalities but they are also more friendly here than at other resorts in the Maldives, so if you are a people-person you probably won't have any difficulties finding other people to chat to over dinner. And by 'people' I mean couples. 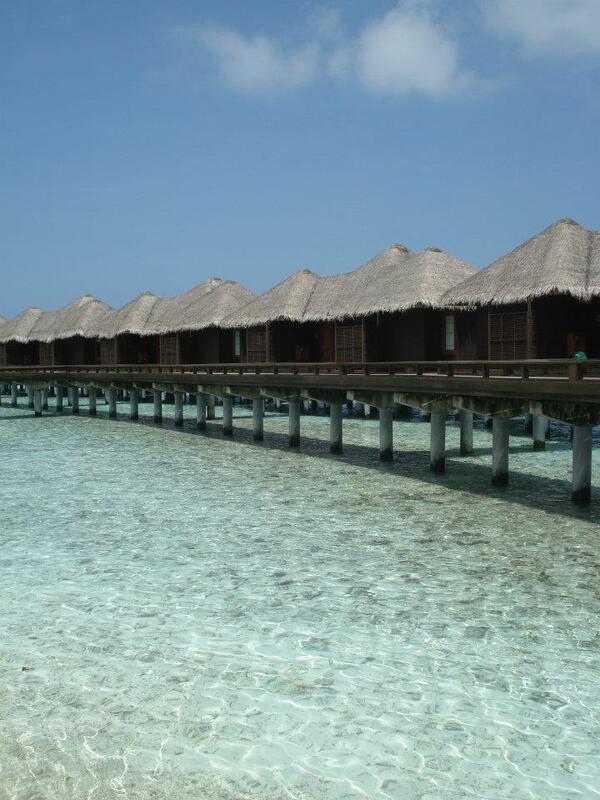 99.9% of resort guests in the Maldives are couples, although that could be changing. A handful of resorts are trying to encourage groups of friends to holiday together there, and the Small Island Company is trying particularly hard to break down the couples-only environment at the funky new Finolhu resort.